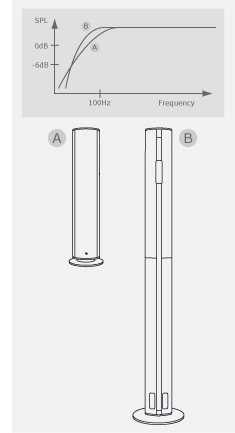 The bass extender is a novel technique that allows the bass performance of a speaker to be enhanced by utilising the internal air volume within the matching stand. This innovative design combines the practical requirement of positioning the speaker at the ideal height, while providing customers with the opportunity to get the very best from the speaker without compromising the slim, elegant appearance. The bass extension of a loudspeaker is critically dependent on the air volume inside the enclosure - the more volume you have the more bass extension you can achieve - and the speaker will correspondingly sound more natural and realistic. As speaker designers we are always looking to house the largest volume we can in the most compact-looking enclosures, and to make it as easy as possible for customers to experience high quality sound reproduction in the home. Home theatre speakers such as the KHT6000 are purposefully designed to look unobtrusive and elegant when placed in close proximity to a typical flat panel TV screen. The stand of the KHT6000 visually integrates with the satellite in a very simple and elegant way while at the same time offering us an extra few litres of air volume that we can usefully utilise to enhance the speaker's bass performance.